After all these months of being unemployed, I FINALLY found a job. I started mid-April. It's only part-time, but it gets me out of the house for a couple of hours a day (plus) and provides us with benefits (BIG PLUS). However, for the past couple of weeks I have been working full-time due to others taking their much needed time off for vacations and stuff. At first, I didn't mind full-time because, hello much needed extra money, but man if I didn't get use to my part-time hours....these full-time hours are killing me. This blows my mind! I didn't want to become that way, so in love with my part-time hours that a full 9 hour day would throw me off kilter. BUT IT DOES! And it definitely cuts into my baking/blogging time. When I saw this recipe for fresh Strawberry Ice Cream on Lady Behind The Curtain I knew that I would definitely make time for it. This was my third venture into ice cream making and this ice cream is totally my favorite so far. The strawberry flavor is so good and its super creamy...its just completely yummy. Next, half the strawberry mixture, but try to leave as much juice in the remaining half as possible. Then mash the berries left in the juice. In a large mixing bowl, stir together the milk, heavy cream, mashed strawberry juice mixture, and vanilla. Turn the ice cream machine on and pour the mixture into the freezer bowl and allow the mixture to thickened, which will probably take around 20-25 minutes. Before mixing is done, with about 5 minutes left, add the reserved strawberries and let that mix completely. The ice cream will be really soft, so for a nice firm ice cream, freeze in an airtight container for around 2 hours. This makes around 2 quarts. 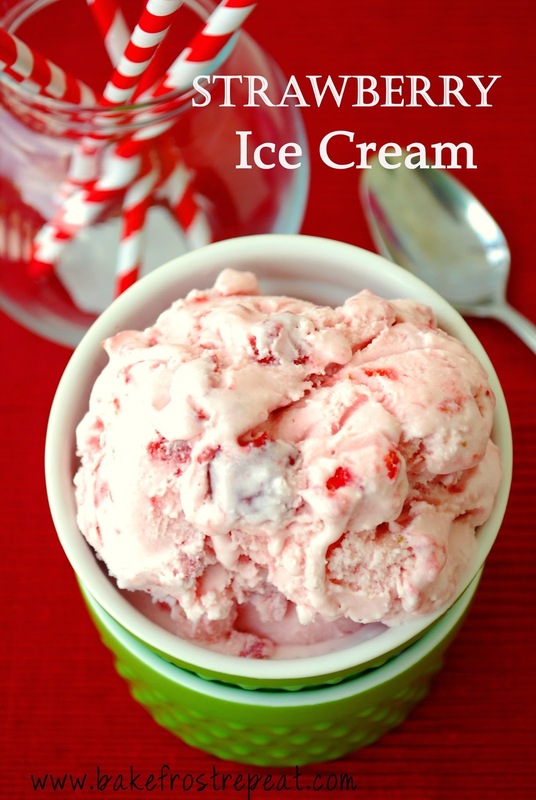 I love strawberry ice cream and this looks delicious, but I can never *not* eat the strawberries that I buy fresh! The recipe sounds delicious and I agree with Leah - that photo looks like it should be in a magazine! Oooh I just got an ice cream machine and am on the lookout for some lovely recipes! This one looks fantastic!